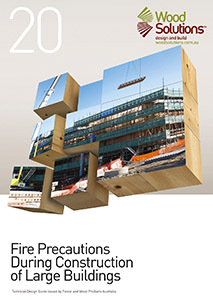 The role of this document is to provide information to help the broad range of people and organisations with responsibilities for fire safety on a construction site to reduce the risk of fire. The information applies to the design and planning stages as well as the actual construction phase, and many hazards can be addressed by good design and planning before they become an issue. Construction projects can include demolition, alterations, renovations, repair and maintenance as well as new buildings. This guide does not apply to the completed structure. Minimum community building standards for fire safety in completed buildings are mandated by State and Territory Acts and Regulations that normally require compliance with the National Construction Code (NCC), among other things. WHS legislation may require additional fire precautions to be implemented, such as evacuation plans and emergency procedures. Any recommendations in this guide do not negate the need to comply with all relevant legislation and contractual requirements. Information to help people and organisations with responsibilities for fire safety on a construction site to reduce the risk of fire.